Having already been feted with exhaustive box sets, multidisc anthologies, vault finds, tribute albums, a posthumous autobiography, and dozens of original album reissues, one might ask: what’s left to say? As it turns out: plenty. 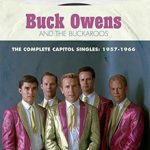 Collecting Owens’ A’s and B’s from his most commercially fertile years, this generous two-disc set replays Owens’ emergence and dominance as both a country hit maker and a maverick artist. Recording in Hollywood, two thousand miles from Nashville, he added a new chapter to the country music playbook with the driving, electric Bakersfield sound, and established himself as an iconoclastic force on the both the singles and album charts. Among the fifty-six tracks collected here are twenty-two Top 40 hits, including an astonishing string of thirteen consecutive chart toppers. While the hits will be familiar to most, and the B-sides to many, only the most ardent Owens fans will recognize the earliest Capitol singles. This quartet of originals, waxed in 1957, sounds more like Buddy Holly-styled rock ‘n’ roll than the Bakersfield sting Owens would later develop. The low twanging guitar, sweetly phrased lead vocal and backing chorus of “Come Back” is more doo-wop than country, and its waltz-time B-side “I Know What It Means” sounds like Nashville going pop. “Sweet Thing,” co-written with Harlan Howard, has rockabilly licks supplied by guitarists Gene Moles and Roy Nichols, and its ballad B-side, “I Only Know That I Love You” has a lovely guitar solo to accompany its double-crossed lyric. Owens returned to Capitol’s studio in 1958 with a reconstructed backing unit that included fiddler J.R. “Jelly” Sanders and Ralph Mooney on steel. It was from this session that “Second Fiddle” launched Owens onto the country chart. The same group, which also included pianist George French, Jr., bassist Al Williams and drummer Pee Wee Adams, cut a 1959 session from which “Under Your Spell Again” climbed to #4. By year’s end, Sanders was out and Don Rich was in, Harlan Howard’s “Above and Beyond” carried Owens one notch higher, to #3, and Howard and Owens’ “Excuse Me (I Think I’ve Got a Heartache)” then reached #2. The B-sides include the charting “I’ve Got a Right to Know,” and the ironic “Tired of Livin’.” Ironic, because the song’s sad-sack complaint about a lack of success was fronted by a Top 5 hit! While Nashville was busy courting pop fans with syrupy layers of strings and choruses, Owens was stripping his sound down to guitars, bass, fiddle and drums, and riding the beat. He also bucked another Nashville standard by recording with his band, rather than picking up session players. Red Simpson sat in for a few sessions in ‘65 and ‘66, and James Burton provided the sputtering electric lead on “Open Up Your Heart,” but what you hear on all the singles from ‘64 onward are the Buckaroos. The set ends with Owens’ last hit of 1966, “Where Does the Good Times Go,” two singles shy of the end of his continuous string of #1s, and well short of the success that ran up to Don Rich’s 1974 death. Owens moved on from Capitol to Warner Brothers, and returned again in the late ‘80s, but mostly retired from the studio to run his businesses and perform on the weekends at his legendary Bakersfield club. This entry was posted on Friday, December 9th, 2016 at 11:54 am	and is filed under CD Review, Reissue. You can follow any responses to this entry through the RSS 2.0 feed. Both comments and pings are currently closed.